Andrews McMeel Publishing, 9781449470890, 144pp. 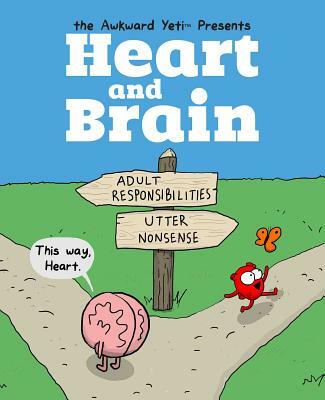 New York Times best seller, Heart and Brain: An Awkward Yeti Collection illustrates the relationship between the sensible Brain and its emotionally driven counterpart, the Heart. Boasting more than two million pageviews per month, TheAwkwardYeti.com has become a webcomic staple since its creation in 2012. In addition to tons of fan favorites, Heart and Brain contains more than 75 brand new comics that have never been seen online. From paying taxes and getting up for work to dancing with kittens and starting a band, readers everywhere will relate to the ongoing struggle between Heart and Brain. The Awkward Yeti was created by cartoonist Nick Seluk in late 2012, followed by the Heart and Brain spinoff in 2014. Nick pursued his lifelong dream of being a professional cartoonist after serving nine years in the corporate world as a graphic designer. In his childhood, he drew inspiration from classics like Calvin and Hobbes, The Far Side, Garfield, and The Simpsons. Nick lives with his wife, three young kids, and a lovable, ornery old dog in the suburbs of Detroit. Heart and Brain, and a growing cast of organs can be found at theAwkwardYeti.com and on most social media sites.